Treatment of Dupuytren’s Disease using Radiotherapy has been studied and described in the medical literature since the 80’s and is now an established method for treating early stage active Dupuytren’s and also Ledderhose. The treatment can stop or slow down Dupuytren’s disease in its early stage, best if the disease is active (growing) so it is sensitive to the radiation but before there is a contracture of more than 10 degrees. In the UK the National Institute for Health and Clinical Excellence (NICE) has issued limited guidance to the NHS for Radiotherapy on early Dupuytren’s disease (2016). There are a few places where it is available on the NHS, and there are more clinics offering this treatment privately in England, see the map lower down on this page. Radiation Therapy or Radiotherapy is a well established treatment for cancer, that uses ionizing radiation to damage the DNA in cancerous cells. It can also be used for the treatment of benign tumours, but this is not done as often since these tumours are not usually life threatening. For superficial conditions like Dupuytren’s the amount of radiation given is a lot lower than that for malignant conditions, which reduces the risk of side effects greatly. With radiation therapy, the nodules and cords associated with Dupuytren’s are irradiated either with X-Rays or with electrons (see this blog for the difference). This is done over five days in a row applying a daily dose of 3Gy with penetration limited to a few mm only, making a total dose of 15Gy. (This is the ‘German or European protocol’). See also Dupuytren’s Radiotherapy. The British Dupuytren’s Society and Prof Tim Davis produced a webinar on surgery and radiotherapy for Dupuytren’s, with several other eminent Dupuytren’s treatment providers speaking as well. It can be found on YouTube. After a break of typically eight to twelve weeks, the treatment is repeated. This is the most commonly used protocol, there are others in use, for instance treating seven days and no repeat. The disease needs to be symptomatic (active) at the time of treatment and often the result is a softening of nodules or cords, and a slow down or even complete halt in the disease progression. Beneficial results may take a few months to a year to become apparent. Electrons are used a lot for treating cancer patients. However some Centres use mainly the Linear Accelerator to produce electrons and also to treat Dupuytren’s or Ledderhose. This means you may have a longer wait for treatment because those having cancer treatment will be prioritised. All radiation carries some degree of risk to health, but in this case the risks are extremely low due to the low dose, penetration limited to just a few mm, the location of the target being an extremity of a hand or foot hence away from critical organs, and in the case of using electron beams the narrow field being localised to the treatment target with no scatter (no need to shield other parts of the body with lead). One of the UK’s leading radiation oncologists had an independent audit done in 2016 of his results of radiotherapy for early Dupuytren’s. The results of treating 150 patients were audited, no serious adverse reactions were noted and 91 percent of patients had the disease progression stopped or even improved with the treatment. 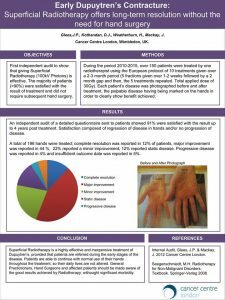 The poster presented at a large radiotherapy conference can be downloaded as pdf Early Dupuytrens RT audit poster Dr J Glees or viewed here. A short YouTube video explaining radiotherapy for Dupuytren’s Disease can be found here. A list of the clinics can be found on our Doctors page. Read here the story of the first patient to have radiotherapy on the NHS. An account of private treatment in the UK can be found here. More stories of different treatments can be found in the stories section. A UK patient has provided a very good and informative page on radiotherapy in Germany. This includes lots of useful tips on hotels and bus/train connections in the area, a flowchart on treatment choices, and a question and answer dialogue with Prof Heinrich Seegenschmiedt the pioneer of using radiotherapy for treating Dupuytren’s. It was written in 2012.